Telephone call charges, laundry charges, tips and all personal items. In the afternoon visit Ta Dzong, an ancient watchtower converted as National Museum of Bhutan since 1967. Thereafter, visit Rimpung Dzong (Paro Dzong) built in 1646 by Shabdrung Ngawang Namgyal currently district administrative centre. Start early morning excursion to Tiger nest. The path is up-hill through pine forest. Taktsang Monastery known as Tiger’s nest; clings at the edge of the sheer rock cliff. It is believed that Guru Padmasambhava who brought Buddhism to Bhutan in 747AD flew in on the back of a flying tigrees. 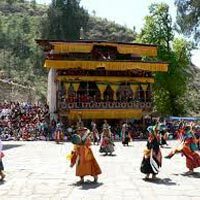 While returning from Taktsang, visit Drukgyel Dzong, built by Shabdrung Ngawang Namgyal to commemorate the victory over the Tibetan invaders in1644. The dzong was destroyed in accidental fire in 1951 and now in ruins state. You can enjoy, amazing views of snow capped mountain, if the weather is clear. Drive to Thimphu. After breakfast drive to Punakha via Dochula Pass (3140 m). 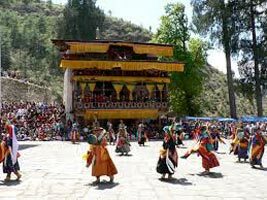 On the way, visit Chimi Lhakhang-“temple of fertility” built by Lama Drukpa Kinley, “the Devine Mad Man” in 15th century. Visit Punakha Dzong after lunch, built in 1637 by Shabdrung Ngawang Namgyal. The dzong is situated between Pho Chu (Male River) and Mo Chu (Female River). The Dzong (Fortress) was built by Shabdrung Ngawang Namgyal in 1637. The wars items captured during the wars with Tibet are preserved in this dzong. Punakha is the winter residence of Central Monastic Body. Drive to Thimphu. After breakfast, visit National Memorial Chorten, a monument dedicated to the third King Jigme Dorji Wangchuck of Bhutan. The paintings and statues inside Chorten provide a very rare insight of the Buddhist philosophy. Visit National Library, which holds a vast collection of ancient Buddhist manuscripts. Then visit National Institute of Zorig Tshesung, where students learn 13 traditional arts & crafts. This institute is known as painting school, famous for carving and free hand art.